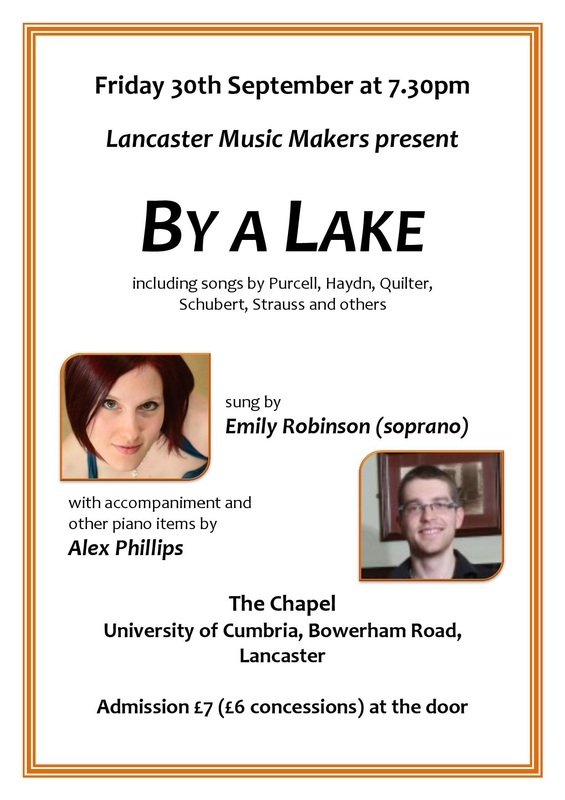 ​Next Friday, Alex Phillips and I will be doing a concert at the University of Cumbria chapel in Lancaster. The grand piano there is fantastic and we'll be making a heck of a fab noise between the pair of us, I'm sure! ​The programme once again is on the subject of nature, tapping in to the feelings most of us who live around here have about the area where we're lucky enough to live. Come and join us for a celebration of nature. ​A few years ago, someone suggested to me that I should do a recital. My surprised reply may have contained some expletives that possibly should not be repeated here. ​Nonetheless, it happened. I did a lovely little concert at Ings Church, which was extremely well-attended, thanks in no small part to a very loyal local church congregation, and also possibly to a three-line whip from the organiser. Well, whatever puts bums on seats, say I. ​Anyway, the point I'm gradually coming round to is that finally, after three years or so, I'm going back to Ings Church to do another one. This time I think the programme is rather better thought out. I've called it 'By a Lake', and I've filled it with lovely, atmospheric music about nature; trees and forest glades, fields, hills and valleys, flowers and butterflies, the moon, stars and sun, and the water. We all love living in the Lake District, I reasoned; why not celebrate it? ​So next Sunday, 21st August at 2.30pm, accompanied by Alex Phillips-Yates, I shall be musically holding forth at length on the subject of the awesomeness of nature. There will be a couple of pieces in there that people know, but I've also dug up some absolute gems that I didn't know existed. I'm excited to share them. Or not. It's a tad on the rainy side at the moment. Which makes it all the more essential to go to concerts in the evenings, correct? Of course. 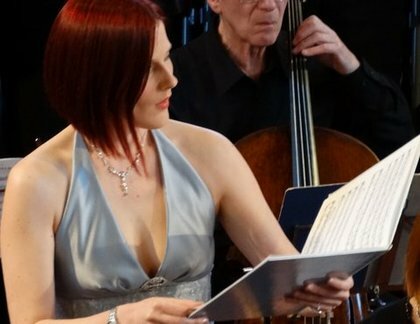 ​Tomorrow evening I'll be at St Michael and All Angels' Church, Hawkshead, doing a lovely little recital alongside Charles Edmondson at the piano. It's all very rousing music, and there's something for everyone. I didn't know quite how well publicised it was going to be, until I started getting messages on Facebook from people who I have never met, telling me I'd been in the paper. Ha! ​Preparations are well underway for my two summer recitals. Well, I call them summer recitals, though one's at the end of September. Who knows, maybe we'll get our summer then? It's happened in the past....But I digress. I've been putting together some really exciting and less well-known repertoire on the theme of 'nature'. It's a pretty wide subject, and it's been covered at length in the musical kingdom, especially in the Romantic period. I've tried to pull in some other stuff as well, though, and include plenty of music in English. It seems a little bit pointless singing about the beauty of hills and flowers if my audience can't understand what I'm singing about! It doesn't seem to be too hard to find songs in English about nature, though. It appears that historically it's been one of our composers' biggest inspirations. Understandable, really, especially when you get outside and look at the beautiful landscape around where I live! 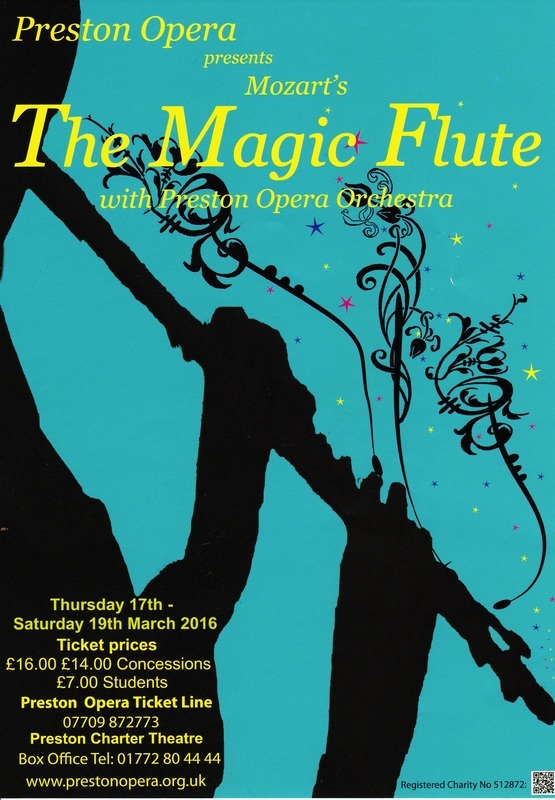 Preston Opera's production of Mozart's 'The Magic Flute' is in full swing. Scary and magical on-stage, all lovey-dovey and very careful going through doors backstage, I'm feeling the production vibe of the whole affair! It's well worth a watch. The cast are doing a brilliant job of bringing the show to life, and the orchestra - led by the excellent Colin Beeson - have been stellar. Stellar...stars...Queen of the Night...get it? There are still two opportunities to come and see us at Preston Guild Hall, on the 18th and 19th March. The show starts at 7.30. I loved the film 'Amadeus' the very first time I watched it. And the second time. And probably also the fiftieth time. It's not just the portrayal of Mozart's life - I think the film's portrayal of the great man himself, although it may be highly entertaining and we'd like it to be true, should probably be taken with a pinch of salt. And I suspect that poor Salieri would be turning in his grave if he found out what he was being accused of. What really made me love the film was the way that it set out Mozart's stall, as it were. I was pretty young when I saw it, and not really too familiar with Mozart's work; the film offered up a fine selection of some of his absolute 'greatest hits' in fine fashion, and got me hooked. The incredible 'Confutatis' in the Requiem; the Papageno/Papagena duet in the Magic Flute; the 'too many notes' aria in Die Entfuhrung aus dem Serail. That 'Gran Partita' oboe moment gets me every time. I don't know how he did it. So much heavenly music came from the man, it's beyond belief. Oh, ok, fine, here it is. I'll just have a quick listen to it and cry for a bit. Whether we love Christmas or tolerate it, it can't be denied that it's creeping up on us, and Christmas concerts are coming soon. This year, I somehow seem to have dodged the necessity of doing any cheesy Christmas repertoire, though I may be strongly tempted to go and do some carol singing at some point. Definitely not till December, though - November is not Christmas and never will be, no matter how much the shops try to convince us otherwise! Anyway, December will see me doing some lovely concerts. On the 5th December I'll be at Lancaster Priory doing Haydn's Nelson Mass again, this time with Lancaster and District Choral. Even though I've already done it twice this year, never be tempted to think I'll ever get bored of it! Then, on the 12th and 13th December, I've somehow managed to land myself back-to-back performances of Handel's Messiah. 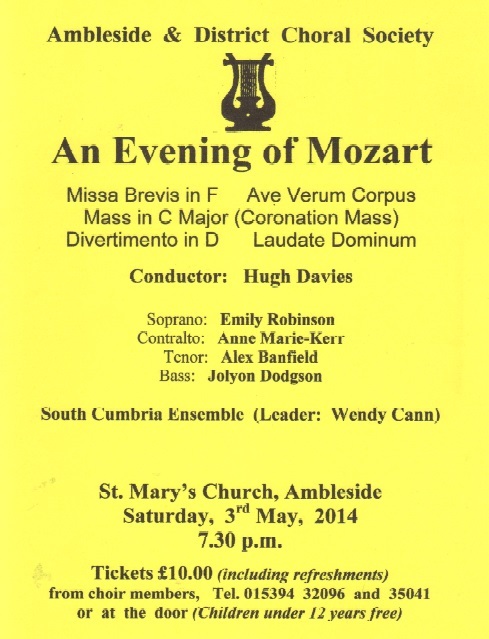 The first is at the lovely St Mary's Church at Ambleside, and is a full rendition of the work (with a couple of minor seasonal cuts); the second performance is the first section only of the work, and will be at the rather large Parish Church in Kendal (poster on left). I'm sure all of these are going to be fabulous occasions, it'll be great to get stuck in. And then, I'll get stuck into Christmas dinner. Likely with comparable gusto. Getting excited all over again! 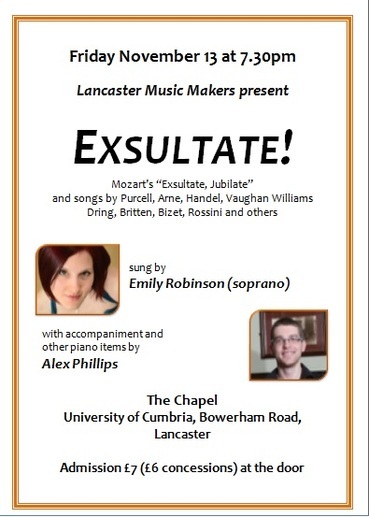 Free reign to organise my own programme means I got to be totally self-indulgent (again) and put together some absolutely gorgeous repertoire for this concert in Lancaster on the 13th November. I feel so privileged to have the freedom to be able to choose ANYTHING and build a concert around it. For this one, I decided to have Mozart's 'Exsultate, jubilate' as the core, and build around that. The first half will be English song, through the ages from Purcell to Dring (though not necessarily in the correct order! ), and I'll finish the programme with a variety of over-the-top character opera pieces, including Bizet's ridiculously famous 'Habanera'. I'll be assisted on the piano once again by the wonderful Alex Phillips, who will also play a couple of pieces of his own. The recital in June was wonderful and I've had a lovely relaxing summer. Time to hit the tiles again and do some more singing! I'm doing a crazy mix of favourites this coming weekend at the Olde Mill at Bardsea, which I'm sure will be jolly good fun all round. The leaflet on the right here is for a concert in a few weeks that I've been excited about for over a year, when they booked me for it! 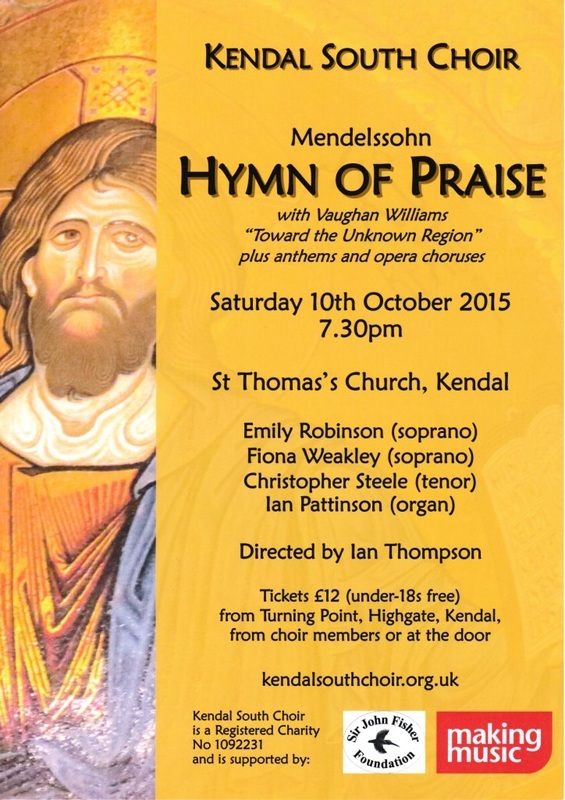 It'll be the first time I have sung with the excellent Kendal South Choir, directed by the multi-talented musical pedigree that is Ian Thompson. Super line up of soloists (if I do say so myself...muahaha!) with Fiona Weakley's mellow tones and Chris Steele's flawless tenor. Plus, I get to crack out the Easter Hymn. It's a cracker. Here we are! The main event of this year...for me, anyway! I can't wait. We're doing so much gorgeous music. I've been totally self-indulgent and picked loads of stuff I really love, which means I'll probably sing it better than if I didn't. So do come! It'll be ace! OH OH OH! Excited, scared, happy, eek! Ok, calm down. 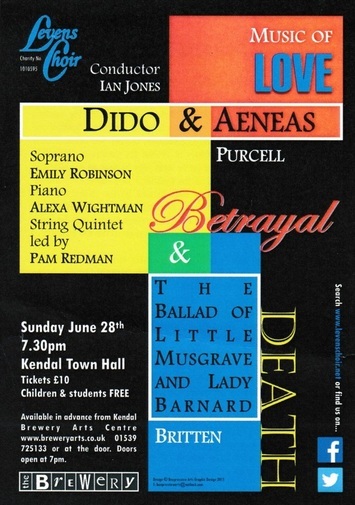 First, I really must mention that I'm singing the part of Dido at Kendal Town Hall for Levens Choir's imaginative new setting of Purcell's 'Dido and Aeneas' on the 28th June. 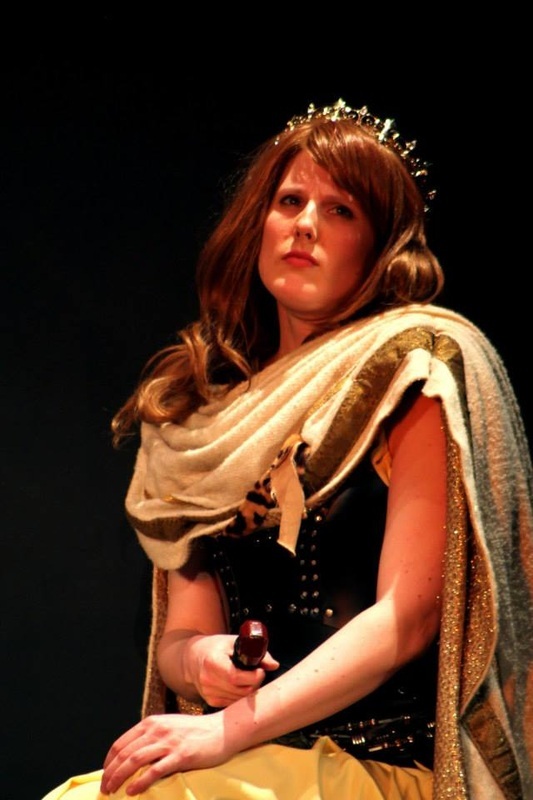 It's a bit of a dream role for me as I get to be both a Queen and a bit emo at the same time. What's not to like? I'm starting rehearsals with them for that next week and I can't wait to see how it's coming along. Here's the poster for the production (designed by Becky Hutchinson) which I think is absolutely amazing. But the thing that's making me jiggle around like a dormouse that just located the cheese fridges at Booth's, is that I just got the publicity stuff through for my recital in July! I'll put that up as soon as I figure out how to convert it to a .jpg. Yes, I know. I need to live in the now. No, it's natural. Honest, m'lud. Anyway! I'm so so so excited for the next project - Purcell's masterpiece opera, Dido & Aeneas, with Levens Choir at the Town Hall in Kendal on June 28th. 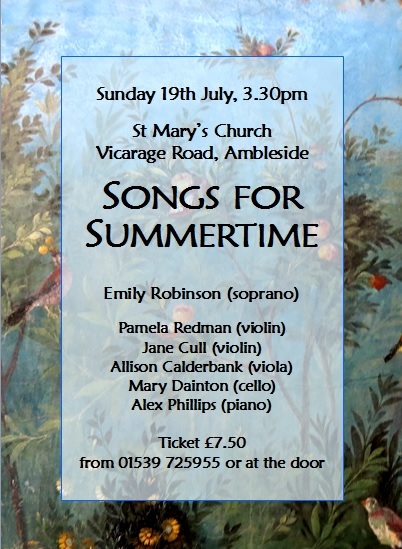 After that, it's a mere sniff until my recital at the church in Ambleside with grand piano and string quartet on July 19th. More to follow soon once I get a spangly poster to put up! What a brilliant show, with a lot of brilliant people. I've heard so many good things about every member of the cast, including specific praise for a heck of a lot of the chorus members individually as well. If you missed it...unlucky. Don't make the same mistake next year! Many thanks to Stuart Atkinson for the lovely photos. I'll put some of them up in the gallery in my Bio section soon. 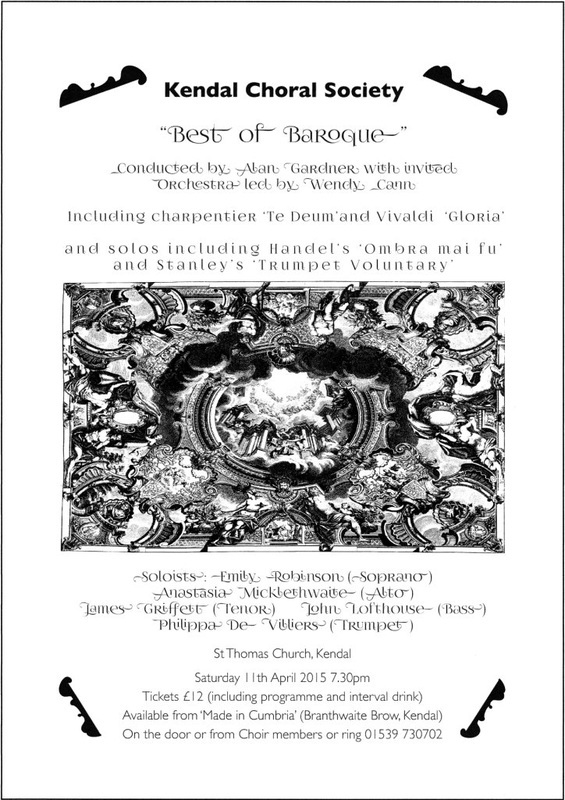 And next...Best of Baroque concert with Kendal Choral on the 11th April at St Thomas's Church, Kendal. It's Musical Director Alan Gardner's last concert, and he told me today 'it better be good'. Uh oh! 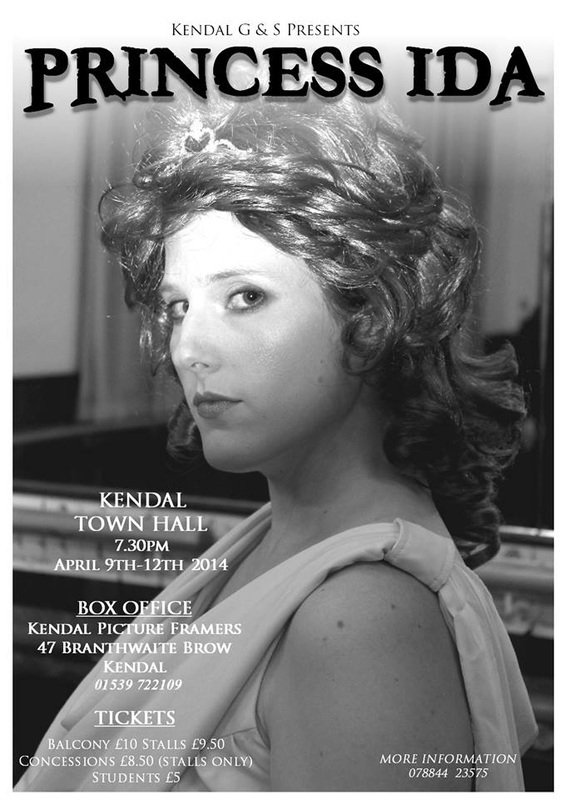 Do come along if you can, 25th to 28th March (Wednesday to Saturday) to Kendal Town Hall for a jolly fine romp in true G&S style. And thanks to Stella Coxon for this fab picture of Mabel and Frederick (me and Neil Hastings). Shame you can see strands of the red hair poking out the side...ha ha. But what's G&S without silly wigs? Am I right? Back later. Just off to break a leg. Concert time is here again! It's not long now before it's time to start filling the airwaves with harmoniously wobbling air molecules. I've got lots of stuff coming up between now and August, the next being this one 'ere, with Kendal Choral Society, with whom I have never sung before. Yet another exciting project! I'll be singing alongside soloists I've never sung with before, which is always a great experience, and singing some fab Baroque music. Can't go wrong with a nice bit of Baroque, let's face it. The Vivaldi Gloria is a tried-and-tested recipe for success, and the Charpentier is gooooorgeous. 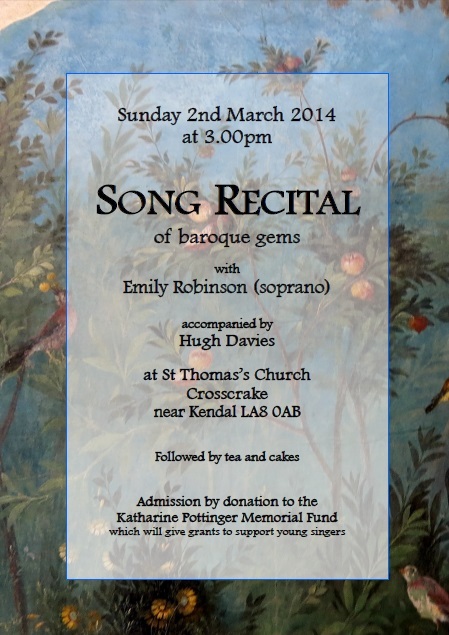 So, St Thomas's Church, Kendal, 11th April. 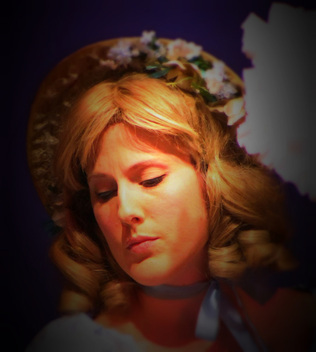 And before that, of course, it'll be Pirates of Penzance. 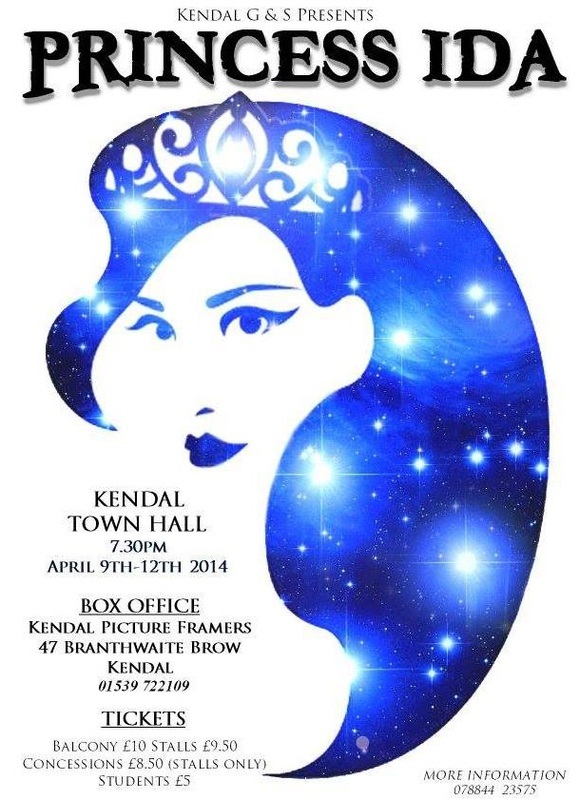 25th to 28th March, Kendal Town Hall. A romp and a half of solid cheese! ....really? Why am I on Twitter? 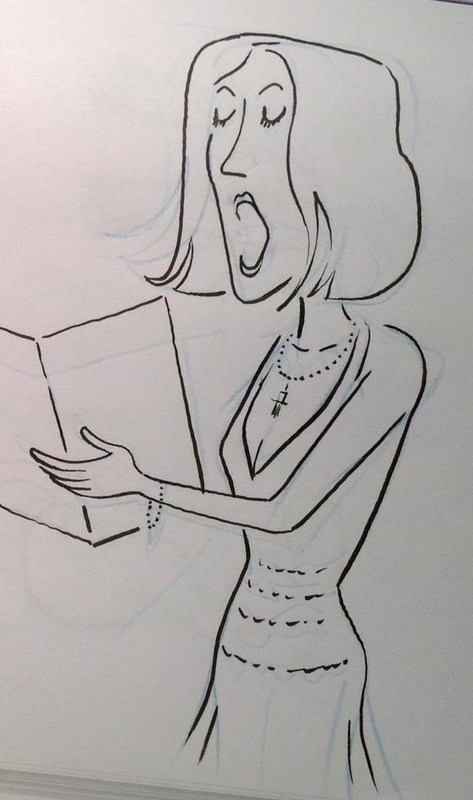 Well, apparently Colin Shelbourn, cartoonist extraordinaire for the Westmorland Gazette, did this caricature of me singing at the Ambleside concert on the 13th December. Could've blown me down with a feather when I saw it! I'm sure you'll agree, the resemblance is uncanny! He's even got the little lacy bits on the front of my dress! Thanks for letting me share this, Colin. It really made my day! Colin has lots of his other stuff at http://www.shelbourn.com/. Tomorrow, tomorrow, I love ya, tomorrow, you're always a day away!...oh, sorry, wrong show! No, really, this is tomorrow. After that, there will be a short interlude while winter happens and there is much complaining about the dark and the cold weather, and then there will, no doubt, be some more singing! Wow, what a fantastic concert on Saturday, and absolutely packed out! It was absolutely incredible to see Lancaster Priory brimming to the rafters with people, and a little bit daunting to get up in the pulpit to do my little 'turn'. But a great atmosphere, a fantastic programme, and the choir produced a really solid and beautiful sound. Well done, Lancaster and District Choral. 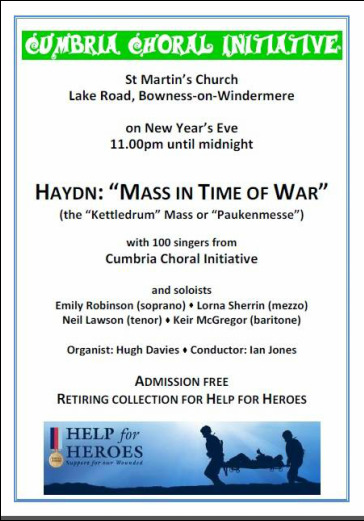 This Saturday 13th December I'll be singing with Ambleside Choral for their concert, which will be Dvorak and Mendelssohn. I'll be singing with the choir for Mendelssohn's Hear My Prayer, known to many as 'the one with O for the wings of a dove in it', but known to me as 'the one I need a stiff gin after' due to having pretty much no breaks at all in the solo line for about 10 minutes. Someone please take a bucket of water to resuscitate me afterwards, thanks. ...Yes, it is that one. It's rather pretty. It was a real pleasure to find that the concert on Thursday was absolutely packed with people. 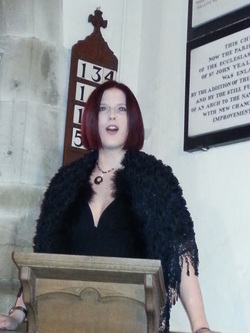 I had a lovely time singing with Eversley Choral. I decided to dress 'soberly' for the occasion, as it was a commemoration concert. Nobody told me I looked like a goth, though. The lens doesn't lie. Someone tell me next time, 'kay? 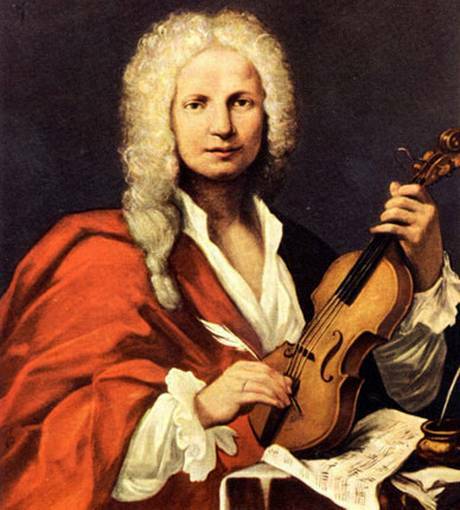 Next mission: Lancaster Priory on December 6th, for Vivaldi's Gloria, one of my favourite works of all time. Fabulous, dahling. I think I'll wear colours this time. Busking! Lots of fun has been had in various locations, notably Lancaster, Kendal, Keswick and Kirkby Lonsdale, though it's getting a bit nippy now to carry on with that sort of behaviour. However, concert season is now creeping up, and I can't wait for all the musical fun that's coming up soon. 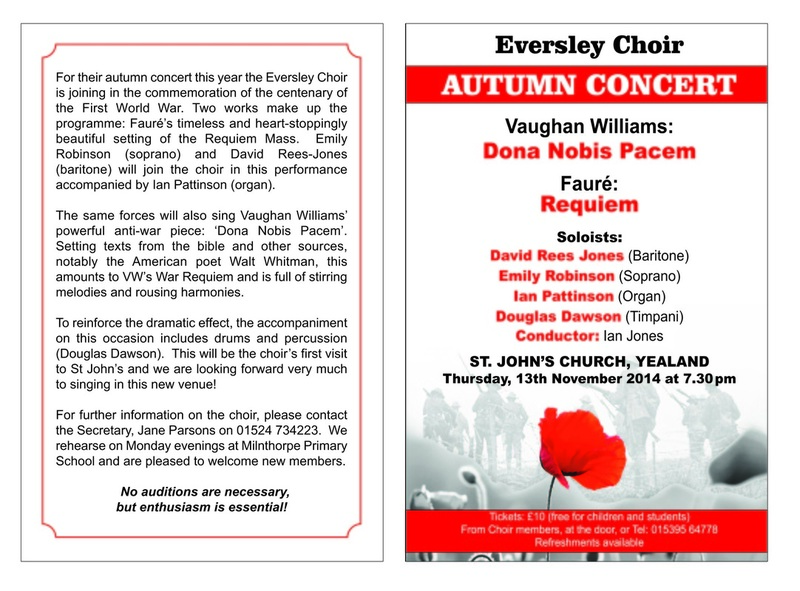 The 13th November will see me singing Vaughan Williams' Dona Nobis Pacem and Fauré's Requiem with Eversley Choral, followed shortly thereafter by Vivaldi's Gloria (among other things) at Lancaster Priory with Lancaster and District Choral Society on December 6th, then Mendelssohn's Hear My Prayer with Ambleside Choral on the 13th December. The excitement is starting to bubble! Well, the show is finished, and I definitely have the post-show blues. 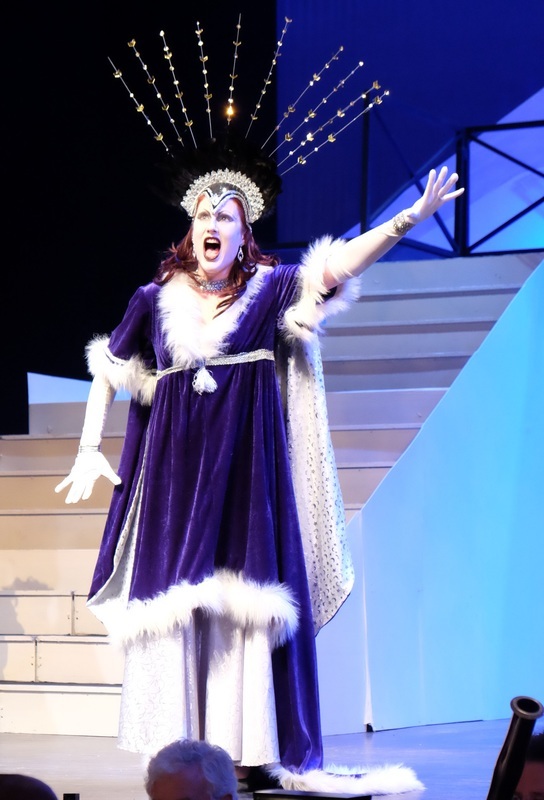 Good job choir rehearsals are going to fill in the gaping hole left in the absence of Princess Ida. What a brilliant time was had! The show was superb, courtesy of everyone who worked so hard at it - the costume people and the lighting chap, the orchestra and musical director, the cast, chorus and chairperson...But most of all, I think, credit has to go to Vanessa for masterminding the whole thing, rewriting the script to bring it up to date, and seeing it all through to the end...and then being in it, as well. 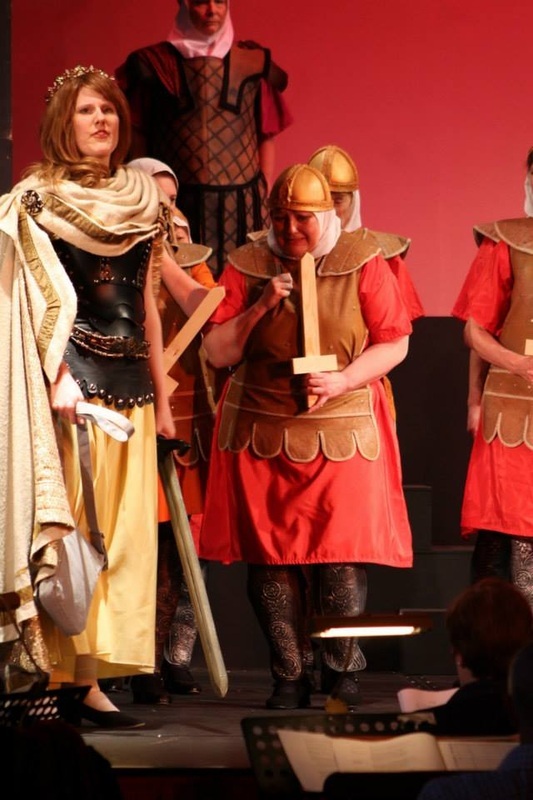 Two days to go until Princess Ida kicks off. Probably with a bang, though hopefully not a literal one! It's really come together now, and last night's rehearsal was looking fabtastic! Yes, I know that's not a word, but if Shakespeare was allowed to do it then I don't see why I can't. Well, the recital was eventful, but I'm very pleased that we managed to make a total of £660 for the Katharine Pottinger Memorial Fund. I hope that Jim Pottinger is on the mend after his unfortunate mishap. A big thank you to Hugh for his Herculean efforts in learning the music (some of it at extremely short notice - sorry, Hugh!) and my mum for her amazing work on publicity and producing the beautiful flyers. I'll be performing with the Encore Opera group at the church in Milnthorpe this Saturday (8th March). 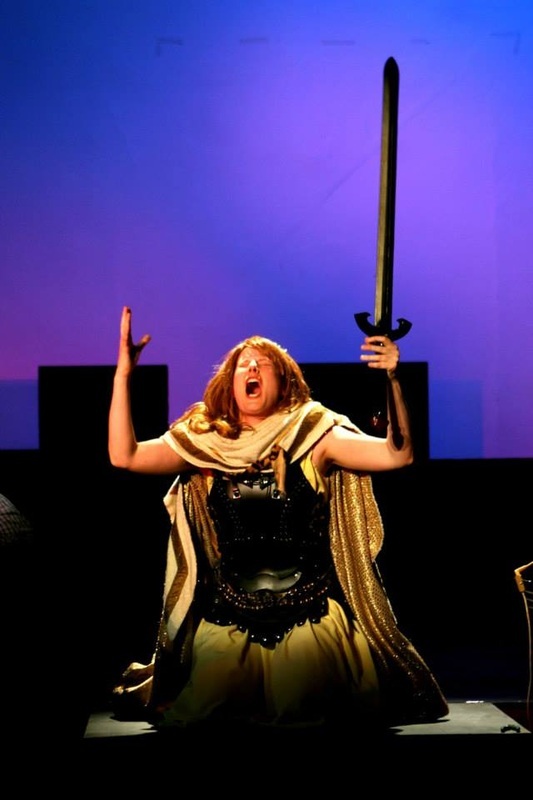 After that, it'll be Princess Ida! Very exciting.